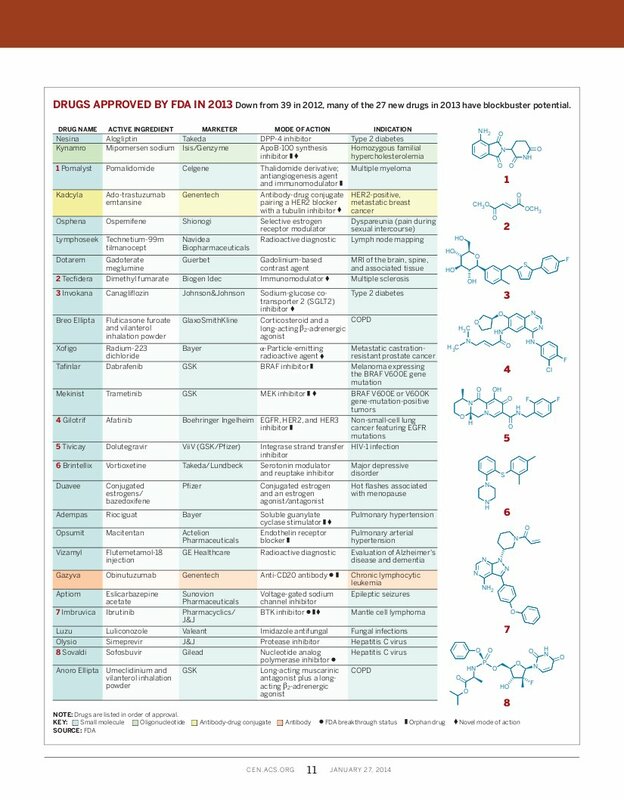 The new drug approvals for 2013 were mostly cancer drugs and drugs for orphan diseases. Other therapeutic areas included metabolic and endocrinological therapies (two type 2 diabetes drugs and one dyslipidaemia drug), antivirals (two hepatitis C virus (HCV) drugs and an HIV drug) and medical imaging products (three approvals). Several of these new drugs are scientifically novel. Gilead’s sofosbuvir is first-in-class NS5B polymerase inhibitor and the first oral HCV drug (Nature Rev. Drug Discov. 12, 409–411; 2013). Pharmacyclics and Janssen’s ibrutinib is a first-in-class Bruton’s tyrosine kinase (BTK) inhibitor, which entered the clinic in 2009, and is now approved for an aggressive form of B cell non-Hodgkin’s lymphoma, but it is now being also tested for other types of cancers such as chronic lymphocytic leukaemia (CLL). Ibrutinib is the second irreversible kinase inhibitor to be approved after afatinib, setting new hope for the development of irreversible agents that have been thought difficult to reach the market in earlier years (Nature Rev. Drug Discov. 12, 649–651; 2013). Biogen Idec’s dimethyl fumarate (formerly BG-12) is an extremely small molecule (MW only 144 Da) that had been approved as an anti-psoriasis drug in Germany as well as for preventing the growth of mold in furniture! Now Biogen Idec gets its approval for dimethyl fumarate as the third oral drug for multiple sclerosis. Drug mechanism remains unclear. GSK’s trametinib is a first-in-class MAPK/ERK kinase (MEK) inhibitor that overcame bioavailability, pharmacokinetics and toxicity problems of previous drug candidates (Nature Rev. Drug Discov. 11, 819–820; 2012). Trametinib is approved for cancers bearing specific BRAF mutations (such as metastatic melanoma). GSK picked up five approvals from the FDA last year (counting the approval granted to ViiV), more than any other drug developer in 2013. Janssen’s canagliflozin, is the first-FDA approved sodium-dependent glucose cotransporter 2 (SGLT2) inhibitor, against type 2 diabetes space. Genzyme and Isis’s mipomersen acts on a novel target, binding apolipoprotein B mRNA, reducing protein synthesis and thereby lowering low-density lipoprotein (LDL) levels. Because of its side effects it may be used only as an orphan disease drug agains homozygous familial hypercholesterolaemia and not as a general cholesterol-lowering agent. Regulators in the European Union (EU) have rejected mipomersen because of its side-effects. Posted on January 31, 2014, in Uncategorized and tagged drugs. Bookmark the permalink. 1 Comment.